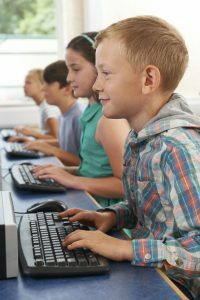 In an education setting, computing can account for a significant proportion of a site’s energy costs. In schools, this can be as much as 25% of the electricity bill! ELe®’s award-winning ICT infrastructure is uniquely designed to deliver reliable, high performance computing for students and staff at a fraction of the energy consumption and carbon footprint. A minimum of 80% reduction in computing related energy bills. More streamlined workspaces with minimal cabling and greater flexibility in how classrooms can be configured. Robust, media-rich computing experiences with rapid log in times and reduced system failures. A more comfortable, quieter working environment. With minimal moving parts in our equipment, ambient noise and heat generation is minimised. Dramatic reductions in carbon emissions – improving your establishment’s environmental profile and potentially creating a ‘live’ case study for new teaching and learning opportunities. ELe® technologies will deliver significant energy efficiencies, operating partially or fully off-grid. If you are aiming to introduce clean, renewable energy to your site, we can also work with to help you achieve your objectives and maximise your energy efficiencies. Rural or Campus Sites – for partically or fully off-grid sites or sites already using sustainable energy sources we can work with you to optimise the benefit of ELe® energy storage and POE based computing technologies. New Builds – for new site constructions ELe®’s streamlined, POE based computing infrastructure can improve workspace planning and eliminate the need for additional cabling and costly plug points.